Woolly mammoth extinction has lessons for modern climate change | "Global Possibilities"
Although humans and woolly mammoths co-existed for millennia, medical the shaggy giants disappeared from the globe between 4,000 and 10,000 years ago, and scientists couldn’t explain until recently exactly how the Flintstonian behemoths went extinct. MacDonald, a professor of geography and of ecology and evolutionary biology, worked with UCLA IoES scientists Robert Wayne and Blaire Van Valkenburgh, UCLA geographer Konstantine Kremenetski, and researchers from UC Santa Cruz, the Russian Academy of Science and the University of Hawaii Manoa.Their work shows that although hunting by people may have contributed to the demise of woolly mammoths, contact with humans isn’t the only reason this furry branch of the Elephantidae family went extinct. By creating the most complete maps to date of all the changes happening thousands of years ago, the researchers showed that the extinction didn’t line up with any single change but with the combination of several new pressures on woolly mammoths.When the last ice age ended about 15,000 years ago, woolly mammoths were on the rise. Warming melted glaciers, but the still-chilly temperatures were downright comfy for such furry animals and kept plant life in just the right balance. It was good weather for growing mammoths’ preferred foods, while still too cold for the development of thick forests to block their paths or for marshy peatlands to slow their stride. But the research explains that the end was coming for the last of the woolly mammoths, who inhabited Beringia, a chilly region linked by the Bering Strait that included wide swaths of Alaska, the Yukon and Siberia.Though humans had hunted woolly mammoths in Siberia for millennia, it wasn’t until the last ice age that people crossed the Bering Strait and began hunting them in Alaska and the Yukon for the first time. After a harsh, 1,500-year cold snap called the Younger Dryas about 13,000 years ago, the climate began to get even warmer. The rising temperatures led to a decline in woolly mammoths’ favored foods, like grasses and willows, and encouraged the growth of low-nutrient conifers and potentially toxic birch. Marshy peatlands developed, forcing the mammoths to struggle through difficult and nutritionally poor terrain, and forests became more abundant, squeezing mammoths out of their former territory. Most of the woolly mammoths died about 10,000 years ago, with the final small populations, which were living on islands, lingering until about 4,000 years ago. Many previous theories about the mammoths’ extinction tended to blame only one thing: hunting, climate changes, disease or even an ice-melting, climate-changing meteor, MacDonald said. The new research marks the first time scientists mapped out and dated so many different aspects of the era at once. Using radiocarbon dating of fossils, the researchers were able to trace the changing locations of peatlands, forests, plant species, mammoth populations and human settlements over time, and they cross-referenced this information with climate-change data.The research used 1,323 mammoth radiocarbon dates, 658 peatland dates, 447 tree dates, and 576 dates from Paleolithic archaeological sites. Scientists from IoES and other UCLA departments obtained samples and worked on radiocarbon dating of the peatlands and the forests, and they created a database uniting information on hundreds of previously dated mammoth samples, developing the final map from thousands of dates and latitude and longitude records.That’s what drew Van Valkenburgh, a paleontologist and professor of ecology and evolutionary biology, to the project.“Glen’s project combined paleobotanical, paleontological, genetic, archaeological and paleoclimate data and did it in a bigger way, with many more data points, than has been done before,” said Van Valkenburgh, who interpreted the archaeological record. 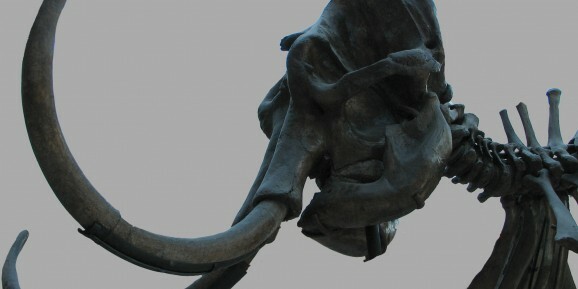 “I was excited to be able to contribute to such an ambitious and exciting study.”She and Wayne, a UCLA molecular geneticist and professor of ecology and evolutionary biology who studies ancient DNA, used different methods of examining the mammoth fossils to reconstruct the ancient population size. Mapping the size and location of both mammoth and human populations alongside temperature changes and plant locations through time gave the researches a uniquely complete view of what happened, MacDonald said. “We are, in a sense, time-traveling with our maps to look at the mammoths,” he said. It’s something MacDonald has dreamed of for a long time, he said. He was working in Siberia several years ago when a colleague found a woolly mammoth tooth.